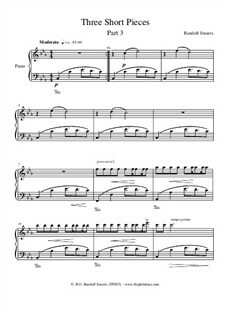 Track 2 from the Works for Piano album (2012) by Randolf Smeets. Note from the composer: After MUN comes the 3 part composition Three Short Pieces (Parts 1-3, number 2-4 on the disc), originally titled Three Pieces in Cm. Written in 2011, these pieces are more structured in a traditional compositional style. 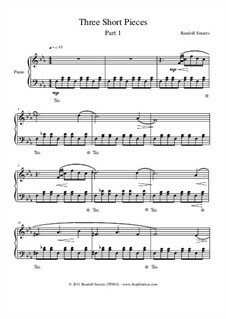 With all three pieces you can hear the left hand providing a tenacious base for the right hand’s melodic (almost minimalistic) lines. This time I wanted to keep it short and providing something more ‘easy listening’. Third track from the Works for Piano album (2012) by Randolf Smeets. 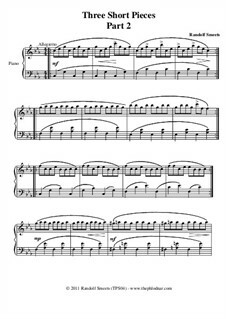 Track 4 from the Works for Piano album (2012) by Randolf Smeets.